Underground reserves may be much smaller and disappearing more rapidly than previously thought according to two new studies. Six months after a NASA-connected study done by independent researchers reported that humanity only has a few decades left before essential systems upholding modern civilization collapse, two new NASA studies warn that more than half of Earths big underground water basins or aquifers are being depleted, and a third are running dry. Furthermore scientists affiliated with the study say we don’t know enough about their capacity and that we are ill-prepared to plan for the rapidly developing situation. The first study says that of the 37 largest aquifers, 21 have exceeded sustainability-tipping points and are being depleted, with 13 considered as significantly distressed. The top 8 have nearly no natural replenishment due to drought, climate change, and population stresses. The earlier January 2015 study, published in Science by the Stockholm Resilience Center revealed that four of nine interdependent planetary boundaries have been crossed. That study builts upon previous studies (2009) showing that these nine processes and systems regulate the stability and resilience of the Earth System characterized as the interactions of land, ocean, atmosphere, and life that together provide conditions upon which our societies depend. The four that were identified as crossed in January are: climate change, loss of biosphere integrity, land-system change, and altered biogeochemical cycles (phosphorus and nitrogen). Two of these, climate change and biosphere integrity, are what the scientists call “core boundaries”. Significantly altering either of these “core boundaries” would “drive the Earth System into a new and less hospitable to humans state”. 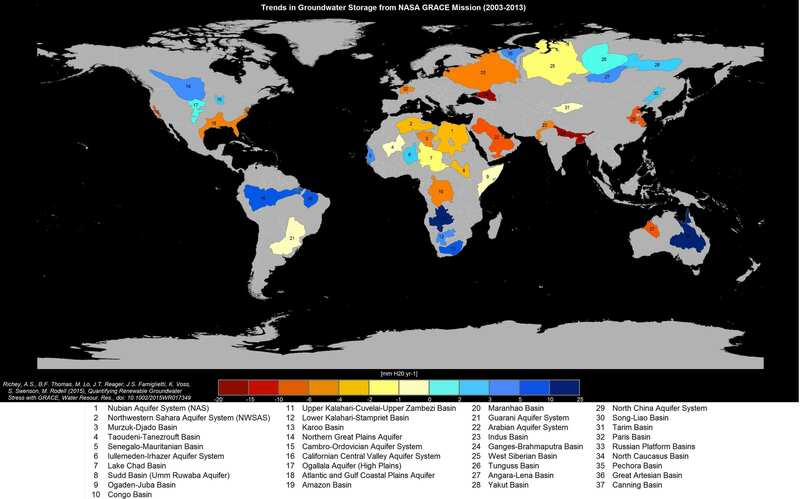 The new aquifer studies indicates that another core boundary, “Freshwater Consumption” is being crossed. This boundary, while not directly referenced in the new studies, has been linked to “cascading local and regional thresholds” that will drive “core boundary” collapses. California’s Central Valley Aquifer is described in the new NASA studies as the most endangered in the US. The recent drought has resulted in an explosion of well-drilling. New groundwater protection laws may take two decades to take effect. According to a June 5, 2015 Report by the Center for Investigative Reporting, tens of thousands of square miles in California are sinking and bridges and highways are being damaged. In addition to running out of water, infrastructure costs linked to industrial use of natural resources, sometimes known as “externalities” are running amok. The new NASA studies led by the University of California, Irvine (UCI), use data available from NASA’s twin GRACE (Gravity Recovery and Climate Experiment) satellites that takes precise measurements of the gravitational pull of the earth. One of the studies, conducted for over a decade, shows that measurements over the aquifers detected significant changes in the underground water levels. The other new study says that the total remaining volume of the world’s usable groundwater is not known, with widely variable estimates. The Arabian Aquifer System, source of water for 60 million people in the Middle East, is the most critically endangered aquifer. The Indus Basin Aquifer of northwestern India and Pakistan, and the Murzuk-Djado Bain in northern African are the next two on the list. Other aquifers identified as endangered in the US include the Atlantic and Gulf Coastal Plains aquifers. Last week the FrackTracker Alliance, a non-profit organization that compiles data, maps and analyses about the impacts of the oil and gas industry released a report analyzing how the industry uses water within the southeastern Ohio Muskingum Watershed Conservancy District. Like many smaller regional water resources, that water district was not identified in the NASA reports but the results of the FracTracker report are chilling and helps to characterize local water use and impact contexts. The FracTracker report compared “industry use” to “residential use” of water in that area which covers approximately 20% of Ohio. Residential water use includes families’ home use, but excludes water for agricultural, industrial and other purposes. This is why environmental regulations are important. Some carnival barkers including some of WNY elected political leaders representing industrial interests disingenuously dismiss them as job killers, but the science proves that they are lifesavers. Which side are you on?